Avanquest CutOut 3 is a masking program designed for easy cutting-out of objects to either remove them from the frame or placing the selection onto a new background. Employing technology similar to blue-screen used in the film industry, this review will discover if CutOut 3 is as easy to use as it looks. Priced at £61, CutOut 3 is available from the Avanquest website. We installed CutOut 3 from a CD that we received in the office. From popping it into the tray to starting the program takes around 6-8 minutes or even longer if you thoroughly read the terms and conditions. Annoyingly, the most time taken is preventing toolbars and default home pages being amended. That kind of stuff is usually offered with Freeware as a way of keeping it free and to that end; it's tolerated. We certainly don't like to see it on a paid application. The worst bit is an advert asking to check your computer for out of date drivers. The only visible way of getting out of it is by clicking Continue. We closed the window which did the trick, but someone who's a newcomer to computers may not have the same nuance and download any of this stuff without realising what they're doing. So the program is off to a bad start because we're annoyed at the installation procedure. So to balance it out a bit, let's look at a few good points. 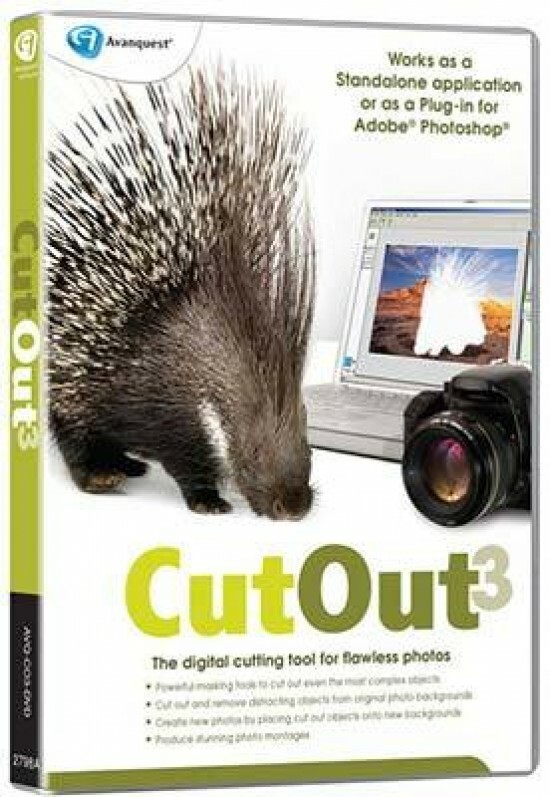 CutOut 3 will work as either a stand-alone product or as a Photoshop plug-in. When installing you can opt to have a desktop icon installed, which we did. Once CutOut 3 was opened, we were prompted to input the licence key to activate the product. After that was complete, we could select the plug-in folder in Program Files for Adobe Photoshop and the program installed the plug-in for us, which is pretty neat. 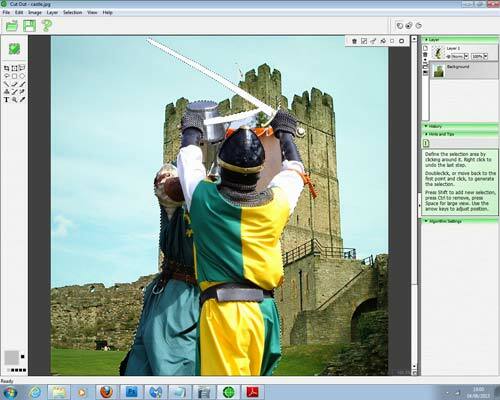 Once you've selected a file that you wish to cut out, you need to tell the program whether you're cutting out the foreground or the background before choosing the type of cutter. There are three to choose from: Blue screen matting (Chroma Keys), Inside/Outside matting or Batch Chromakey. 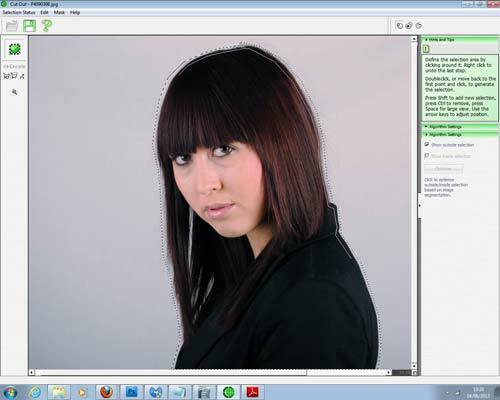 Blue screen matting is used on simple, solid colour backgrounds, such as studio work. For more complex images, you would use the Inside/Outside matting option as you get to determine the outside and inside edge of the subject you're cutting out. If any of this begins to get confusing, there's a large question mark at the top of the window which opens the Help guide. However, for the first time using the program, a Tips window opens and gives a comprehensive explanation of what you're doing. To cut out a subject and place it on a new background, there's a particular way of doing things and, despite the extensiveness, the guide misses stuff out. 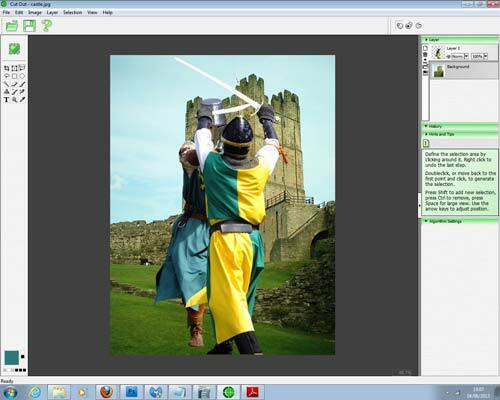 For example, the first step is to open the background before the subject you're cutting out. Now, to open the next image, you can't just go to Open and select your file as that will discard your current background. You have to choose the tiny folder icon down the left side of the layer pallet. Hovering your mouse over will tell you it's the tool for opening a new image as a layer. You then use a selection tool to outline the subject and choose Delete Inverse from the Selection menu. If you have a solid, single colour background, choose the Blue screen matting which uses the same technology found in today's blue screen seen in feature films. Click on the pipette and then use it to select the colour you want to dispose of. The program will do it for you. There will be errors and CutOut knows this and tells you. To know how to get rid of them all, there's three algorithm settings you can use on the right of the picture. The best way to see any errors is by using the mask filter on the bottom left of the screen. Algorithm Settings are split into three sections: Range, Clean and Parameters. The Range will deduce how many pixels can be discarded due to their opacity and colour. 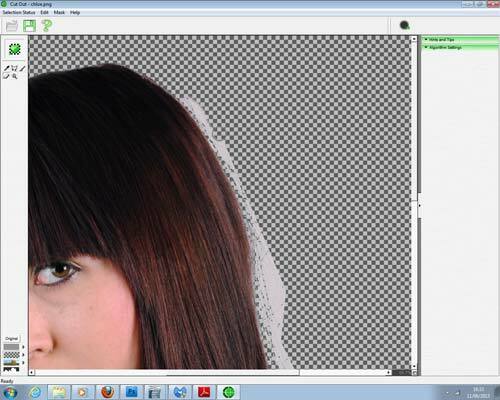 The Clean section is great for removing single stray hairs as they normally have colour bleed over them. The Clean slider will adjust the tolerance of that colour to expand it or contract it. If you have any hard edges with remains of the background, you can feather them by choosing Mask and checking Feather in the Parameters section of the Algorithm settings.